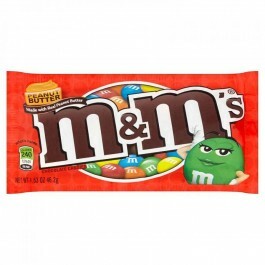 Milk Chocolate (Sugar, Cocoa Butter, Chocolate, Skim Milk, Milkfat, Lactose, Peanuts, Soy Lecithin, Salt, Artificial Flavors), Peanut Butter (Partially Defatted Peanuts), Sugar, Hydrogenated Palm Kernel Oil, Partially Defatted Peanut Flour, Cornstarch, Dextrose, Less Than 1% - Corn Syrup, Natural Flavors, Salt, Dextrin, Coloring (Includes Blue 1 Lake, Red 40, Yellow 6, Yellow 5, Blue 1, Red 40 Lake, Yellow 6 Lake, Yellow 5 Lake, Blue 2, Blue 2 Lake), Propyl Gallate to Maintain Freshness, Gum Acacia. Allergy Information: Contains Peanuts, Milk and Soy. May Contain Tree Nuts.